The subtitle for my speech today is delivering security in a dangerous world. It’s easy to say. It’s harder to do. The virus of insecurity and terrorism seems to be spreading. From New York, Washington and Pennsylvania barely more than a year ago to attacks on US marines in Kuwait, a synagogue in Tunisia, a French oil tanker in the Indian Ocean and a nightclub full of tourists in Bali. Geography is no barrier to terrorists. Race, colour and creed are no protection against their attacks. Yet it would be wrong to paint too bleak a picture. Last week, CIA Director George Tenet wisely urged us to take the threat very seriously. He reminded us all that further outrages are inevitable. Even with the best intelligence, the best countermeasures, the best defences, the lesson of decades of terrorism in Europe is that you cannot hope to foil every attack. Al Qaida is evil. It is brutal, fanatical. It can kill innocent people. It can damage our free societies. But it is a loose coalition of extremists. It is not now, nor ever has been, a threat comparable to fascism or Stalinism. It can only hope to defeat us if we connive in our own destruction. So I say to you with some deliberation that we cannot allow a small, unrepresentative network of criminal extremists to believe that by exploiting the openness of our free societies they somehow have us licked. They are not invincible. They will be defeated in any war where freedom loving people are united against evil. Just consider what has been achieved in the past year, since September 11, 2001. We have built the largest, most powerful coalition the world has ever seen. A coalition based on a global consensus that terror must not and will not be allowed to succeed. That consensus was enshrined in an extraordinarily robust UN Security Council resolution. A resolution which is being implemented across the world. That coalition has enjoyed a year of extraordinary success. The Taliban have been toppled. Bin Laden’s bases have been destroyed and his fighters killed, captured or on the run. Afghanistan has been stabilised. Two million Afghan refugees have already gone home. Terror cells across the world have been crushed. Financial support to terrorists has been cut. Their communications have been disrupted. Look too at the spin-offs. Russia is working as an equal partner with the United States and 18 other Allied nations in the new NATO-Russia Council. An international consensus has been forged that weapons of mass destruction in the hands of rogue states such as that of Saddam Hussein must be dealt with, and we are now near agreement on how to do so. What is the common factor in all of these successes? International cooperation. International action. Not one of the blows struck at terror and insecurity since September 11 could have been launched without countless nations working closely and effectively together. Sometimes this cooperation has been bilateral. Sometimes it has been multilateral, in ad hoc coalitions of the willing. Sometimes it has been channelled through multilateral institutions, such as the United Nations, the European Union and NATO. There is no single blueprint. Take Afghanistan. US diplomacy assembled a series of political and military coalitions, but it was able to do so quickly and successfully because Secretary Powell was not working in a diplomatic vacuum. The UN Security Council passed a uniquely powerful resolution against terrorism. NATO nations had declared that September 11 was an attack on them all, and stood ready to provide assistance, political and military. President Putin offered to open Russian airspace. The Central Asian states, conditioned to working with the West through years of cooperation in NATO’s Partnership for Peace, quickly offered the bases without which the campaign could not have been won. Militarily, the United States also worked at the centre of a multinational campaign. Pakistani troops hunted Taliban and Al Qaida fighters along the Afghan border. Soldiers from 14 NATO countries fought alongside US soldiers clearing caves in the Afghan mountains. In parallel, 11 NATO countries sent troops to bring peace and stability to Kabul. Overhead, British and French aircraft flew combat, reconnaissance, air defence and tanker missions. Supplies for coalition operations flowed through European ports and airspace. And, of course, NATO early warning aircraft patrolled America skies so that US aircraft could be deployed elsewhere. Some have argued that European Allies could have done more. Almost certainly they could have. Some other critics say that the United States could have taken up European offers earlier. And yes, they should have. But both kinds of critics forget that we are still in the early stages of the war against terror. We may perhaps have seen the end of the beginning, to quote Winston Churchill almost exactly sixty years ago. However, this will be a long haul and many more troops from both sides of the Atlantic will be needed on the ground in Afghanistan, the Balkans and elsewhere if we are to completely win our war. Some have argued that the lesson of Afghanistan is that the future of multinational cooperation lies in ad hoc coalitions rather than permanent alliances such as NATO. Perhaps these are the same experts who argued after Kosovo that all military operations would in the future have to be undertaken by NATO. As Secretary General, I am not sure which prospect fills me with most dread. The fact is that Kosovo and Afghanistan, and Bosnia and Desert Storm before them, show one thing clearly: that you cannot conduct either diplomacy or military operations on your own, and that you need different options for different circumstances. But they also show that acting together strongly crucially needs preparation and a habit of working together which comes only from having a core of permanent allies you can trust and who share your values. That is why Europeans recognise the continuing necessity of a close transatlantic security and defence relationship enshrined in NATO. The Europeans needed you in Europe for 40 years of Cold War. They still need you now after a decade or more of post-Cold War instability. 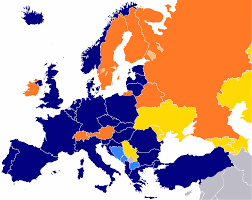 Unlike the Cold War, I do not have to spend my time arguing the public case for NATO in Europe. It is a paradox that the Alliance is on firmer ground over there against today’s complex, multi-dimensional, often ambiguous risks than it was against the clear, overwhelming Soviet threat. Al Qaida and the prospect of endless Balkan civil wars focused European minds in a way SS-20 missiles could not. Recent opinion poll evidence suggests that the same is true on this side of the Atlantic, that the divide is in attitudes is far less marked than gloomier pundits have accepted. I hope that is so because the case for NATO from a US perspective is in my view as strong today as at any time since 1949. Imagine, if you will for a moment, the world today without the Atlantic Alliance. No Article 5 on September 12. No AWACS aircraft sharing the burden of defending your cities. No NATO forces smashing Al Qaida cells in the Balkans. Indeed, no end to the instability in Bosnia, Kosovo and the former Yugoslav Republic of Macedonia. True, there would have been shared values and a flood of bilateral offers of help. But no North Atlantic Council meeting weekly sometimes even daily to concert political and military cooperation. No single focus for US diplomacy in Europe. Remember too that without NATO, there would have been no successful coalitions in Desert Storm or Afghanistan. That is because NATO provides the planning framework, the training, the common standards and the interoperable equipment that enables our forces to work and fight together. Without that glue, our troops, aircraft and ships could do nothing together. The political will may have been there. The military capacity certainly would not. So NATO gives the United States access to a permanent coalition of 18 like-minded, militarily effective Allies. In addition, you get another 26 Partner countries from Ireland through Switzerland to Russia and Uzbekistan, all modernising their armed forces so that they too can work side by side with us. As Lithuanian and Romanian soldiers are now doing in Afghanistan. And since May 2002, NATO gives the United States a forum for mould breaking cooperation with Russia on key topics from terrorism to missile defence to proliferation of weapons of mass destruction. That’s real cooperation, not rhetoric. My conclusion? If NATO did not exist, the United States would be working round the clock today to build something similar. Or, more likely, it would be thrashing about ineffectually in a morass of bilateral links that provided fine words but precious little else. But I recognise that it is not enough for NATO simply to carry on doing what it has always done, no matter how successful it might have been. No organisation can take itself for granted, especially in the post-9/11 world. NATO has to meet the contemporary needs of its members, on both sides of the Atlantic, if it is to remain at the core of our security and defence policies. That was the message in the Administration’s new National Security Strategy, and that message was spot on. We can still argue about what this means and how high you set the bar. For me, the equation is simple: relevance equals roles that matter today plus the political will and capabilities to implement them. Thankfully for the Alliance, we are not starting from scratch. We have achieved much since the Cold War ended. Remember NATO’s legacy in 1990. A strategy designed to deter a threat that has since completely disappeared. Plans focused solely on defence of Europe. Heavy metal forces equipped to fight a short defensive war on home soil against overwhelming odds with no prospect of conventional success. European Allies who were urged to look only at the Fulda Gap, not the extravagancies of power projection. Today’s NATO is already unrecognisable from this legacy. For a decade we have been shifting inexorably towards flexibility, deployability, sustainability; forces to be used, not simply to deter; forces to win, not to gain time. The results were demonstrated in Bosnia, where NATO brought peace and stability after a bloody civil war; in Kosovo, where we pre-empted ethnic cleansing and the spread of instability across the region; and now in Afghanistan where European troops trained and equipped to NATO standards form the bulk of forces engaged on the ground. Politically, we have three new members, a Euro-Atlantic Partnership Council, a NATO-Russia Council and a NATO-Ukraine Commission working on substantive issues and building a robust habit of cooperation. But 9/11 was as great a galvanising force as the end of the Cold War or the disintegration of Yugoslavia. NATO’s member governments know that NATO needs yet again to transform to meet a new security environment. The Prague Summit in late November was always important for the Alliance, with the prospect of a further round of enlargement. Now it is the focus for major changes across NATO’s agenda. You know the issues. Rather than list them, let me give you a glimpse of work in progress as we head towards Prague. First, enlargement. No numbers, no names for the moment. But I am happy that a sound consensus is emerging. A consensus that will strengthen NATO and contribute to the final end of artificial divisions in the Old World. Next, theology. Since our spring meeting of Foreign Ministers in Reykjavik, the in-area/out-of-area debate is dead. NATO may decide on a case-by-case basis not to operate in particular circumstances. But there is agreement at last that there is no bar should it decide to field forces wherever they are required. Third, terrorism. NATO is not set to transmute into the world’s counter-terrorist organisation. The challenge is too complex for any single body and there are other tasks which NATO still needs to do. But at Prague we will unveil a major enhancement in the Alliance’s capacity to contribute to the war against terror. Some measures may not appear glamorous: concepts of operations and collective planning rarely set the pulse racing. They are, however, as essential to our ultimate success as the new capabilities that will also make up the package. Linked to terrorism is the threat from weapons of mass destruction. No one now disagrees that we must act robustly and urgently to prevent these weapons, whether nuclear, biological or chemical, being used against our soldiers or our cities. At Prague, NATO will take a significant leap forward in enabling our forces to defend themselves and civilian populations should the need arise. Next, capabilities more generally. We are not there yet. But here too the picture is improving. The US proposal for a NATO Response Force, a cutting edge capability for high intensity operations at short notice, wherever required, has gained great support and is now being developed from a national idea into multinational reality. In parallel, we are close to agreement on a further radical streamlining of NATO’s command structure to make it better suited for running and supporting missions in the post 9/11 world. The third leg of the capabilities triad is the successor to the Defence Capabilities Initiative, DCI. DCI was not a failure. It delivered real improvements. But we can do better. Much better. And I am delighted that we are now doing so. At Prague through what we call the Prague Capabilities Commitment the NATO nations will commit themselves to acquiring a spectrum of those capabilities which make a real difference in today’s operations: heavy lift, air tankers, precision guided weapons, chemical and biological defences, ground surveillance radars and so on. Not every NATO country will contribute to every capability. Some solutions will be national, some multinational. Some equipment will be bought nationally, some leased jointly. We are at last showing the same flexibility and innovation in acquiring and fielding capabilities that we expect from the service men and women who operate them. As we near Prague, I am continuing to browbeat all NATO governments on capabilities, capabilities, capabilities. In Europe, the message is modernisation or marginalisation. Here in Washington the message is: remove the alibis. Europeans have for years complained that they would like to do more, but the United States was unwilling to transfer the necessary technology. Sometimes it was buy American, not European. Sometimes it was a refusal even to sell US equipment. Today, that simply will not do. If the United States wants Europeans to share the responsibilities and risks of dealing with today’s threats, it must be prepared to transfer the technology needed to modernise European armed forces. We can deal with concerns about onward proliferation and industrial competition. We cannot deal with soldiers unable to communicate with each other, aircraft unable to use precision weapons, commanders unable to see the battlefield. Last weekend, former soldiers from the World War II alliance met in the Egyptian desert to commemorate the Battle of El Alamein. An army of British, Commonwealth, French and Greek soldiers won that turning point battle because the United States released its highest technology equipment, M4 tanks, to its friends ahead of its own troops. You took away our alibi for failure and created the conditions for success. A lesson from history with real relevance today. And today that means fast tracking projects designated at Prague as critical NATO capabilities through the American defence trade control process, just as the United States has done with Allied requirements for Operation Enduring Freedom. I am pleased to see the Administration is tackling this issue seriously. I will end by returning to my subtitle. We do indeed live in a dangerous world. But our enemies are not ten feet tall. They can be defeated. They are being defeated. More importantly, we are defeating them together. You cannot deliver security in isolation. A Maginot Line mentality and a Maginot Line strategy are no more effective against today’s threats than they were in past wars. As a result, this will not be an easy conflict for future generations of military historians to describe. The front lines are blurred. Victory will come as much on the computer screen, in the courtroom, behind the desk as it will on the traditional battlefield. And there is no single institutional vehicle for mobilising allies and friends and directing their collective energies. But four themes will be clear. First, this is a war being fought and won by freedom loving nations working together on an unprecedented scale. Second, this global coalition is underpinned and made possible by the permanent transatlantic coalition that is NATO. Without this permanent foundation, we would have good intentions, but precious few achievements. Third, NATO needs to change and is changing. Prague will set the seal on a profound transformation that will confirm the Alliance’s value to the United States, and to all of its member countries, in the very different strategic landscape of the 21st century. Finally, effective cooperation in security and defence must be the sum of political will plus the right capabilities. At Prague, NATO will silence the siren voices who have repeatedly told us that the transatlantic capabilities gap is too wide to bridge. I have built something of a reputation as Secretary General for telling NATO ministers hard truths about what needs to be done. I am delighted to tell this audience that they seem to be listening. We are all now working together toward common goals, and as a result, Prague will be a major turning point in NATO’s ability to deliver the security that we all need.